Gary Roberts has finally succumbed to his niggling ankle problem. 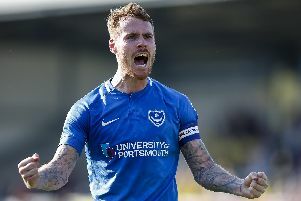 Boss Paul Cook has confirmed the Pompey midfielder will be miss the home clash with Mansfield Town and could be out for two-to-three weeks to give him a chance to get the injury right. Roberts has been unable to train in between games in recent weeks and would have required a pain-killing injection to declare himself fit for the Stags showdown. And Cook felt that meant the time was right to give him a break.